Fascism is a complex and controversial subject. There are those who condemn it, there are even those who admire it and Mussolini (can’t personally see why) but most of these opinions are acritical and based on emotions. Very few people know what Fascism really was and understand its causes, its consequences, its motives, its nature and its rise to power. Being Italian, this is a topic that has obviously always interested me and I’ve been reading everything I could get my hands on on the subject. A book I would recommend to those who are just starting out to study fascism is Breve Storia Del Fascismo (Short History Of Fascism) by Renzo De Felice (I’m not sure if the book has ever been translated into English or other languages, but I found a French version on Amazon.com). 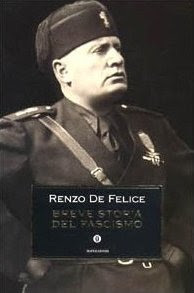 Renzo De Felice was an Italian historian, specializing in the Fascist era. Anyone who is familiar with his work knows that it’s no easy read. The sentences are very long and the language quite complicated and no always clear. You need to read his books very carefully, which can put some people off. You’ll be happy to know that this book is written in a much simpler style and is easy to follow. There are some complicated passages (but then Fascism is a complicated matter) but the book flows easily and is not so hard to understand. That’s because the book was born from a series of documentaries about the history of Italy on which De Felice was working shortly before his death, so the style is more similar to that of a journalist than that of a historian. However, being born out of a documentary series has its cons too. The book covers all the main aspects and events of fascism, from its origins, the March on Rome, the alliance with Hitler, the war.. but all these subjects are treated briefly and not in detail. In a nutshell, the book is a good introduction to fascism but if you want to explore the topic in detail, this book is not for you. I was also disappointed that the book doesn’t talk at all about what life was like under the regime and it only very briefly touches on the subjects of racial laws. I think this is just fundamental to understand its rise to power and how such horrors could have happened. If you are looking for a book that provides a quick introduction to fascism, its story, its events, its causes and nature, I recommend Breve Storia Del Fascismo by Renzo De Felice. Unlike most other De Felice books, the language is simple and, apart from a few passages, easy to follow and understand. However, if you want to know about fascism in detail, this book will disappoint because every topic is only treated briefly and important ones such as what life under fascism was like aren’t covered. Historical Reads: Anne Boleyn Portraits – Which is the True Face of Anne Boleyn?